I want to thank everyone that contributed to the Fruitful Word Ministries Kitchen Drive benefiting victims of Hurricane Ike. I'm excited to share that we collected more than $650 worth of flatware, dishes, and monetary donations. Thank you for talking it up with your women's ministry groups. 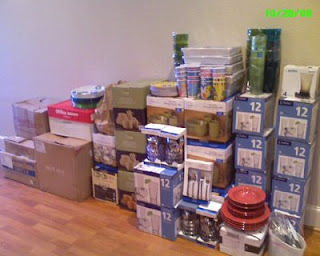 We even had a Sunday school class and a local business donate money to purchase kitchen supplies. Together, we did indeed share the compassion of Christ with families in the Bay Area of Houston as they attempt to restore a sense of normalcy to their homes. Tanya and I had a great time purchasing dishes and flatware before we headed down to the InterFaith Caring Hurricane Ike Relief Center. We spent some time sorting clothing for the center and talking with some of the regular volunteers. Before we left, we saw one woman walking out with some the kitchen items you donated! Please continue to pray for the families in the Bay Area of Houston and in Galveston as they work to rebuild their communities and their homes.